Study for the Medical-Surgical Registered Nurse Examination. Is there a better alternative to Medical-Surgical RN Exam? Is Medical-Surgical RN Exam really the best app in Teaching Tools category? 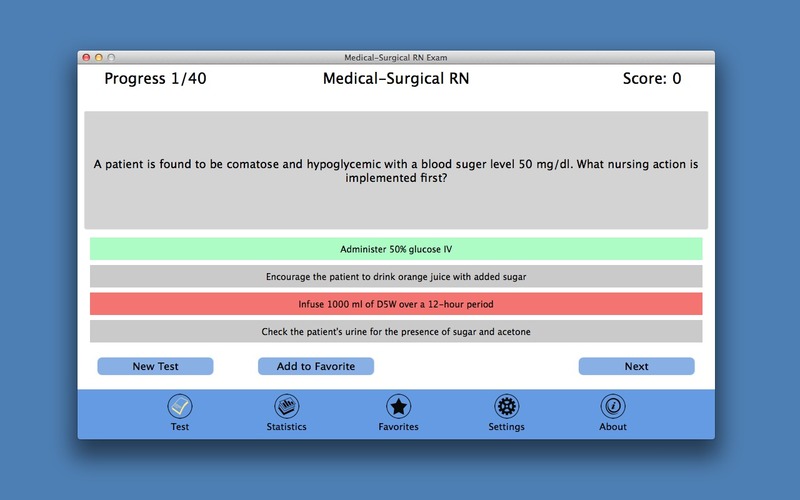 Will Medical-Surgical RN Exam work good on macOS 10.13.4? Try Medical-Surgical RN Exam if you want to check your level of knowledge for the Medical-Surgical Registered Nurse examination. It's quick and easy to use. Our test questions will be an essential study tool for those who are taking their Medical-Surgical RN exam in the near future. The more you practice, the greater would be the chances to pass the Medical-Surgical RN exam in one go. Medical-Surgical RN Exam needs a review. Be the first to review this app and get the discussion started! Medical-Surgical RN Exam needs a rating. Be the first to rate this app and get the discussion started!